This piece was first published on the NYR Daily on November 28, 2016. Over the summer, I traveled to Wuhan to continue my series of talks with people about the challenges facing China. Coming here was part of an effort to break out of the black hole of Beijing politics and explore the view from China’s vast hinterland. In an earlier post, I talked to the documentary filmmaker and feminist scholar Ai Xiaoming, who spoke about her efforts to document those struggling for social justice. Ai had been born in Wuhan but spent most of her adult life in Beijing or Guangzhou. 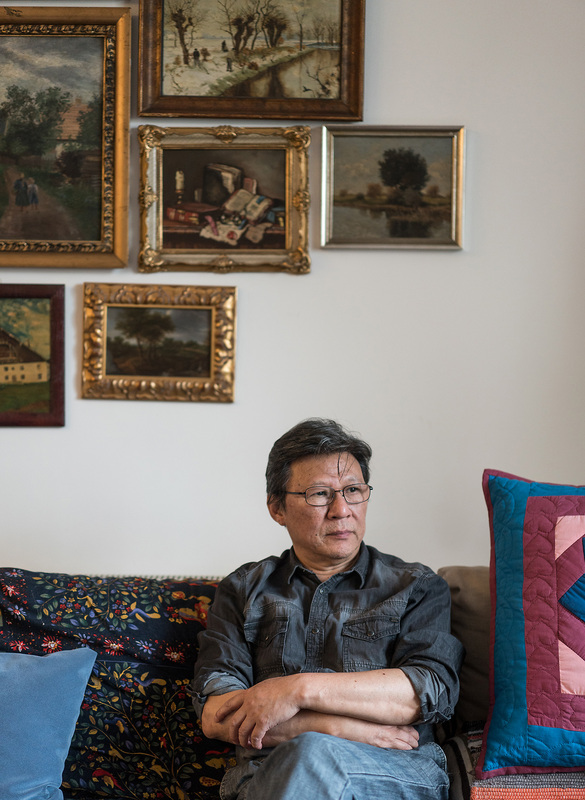 I wanted to talk to someone more permanently rooted in this city, and so was drawn inexorably to Hu Fayun, a 67-year-old writer who has spent his entire life in Wuhan, except for two years during the Cultural Revolution when he was exiled to a village. Hu is a descendant of a long line of local scholars and minor officials from this region. His father was a doctor who in World War II joined the Chinese army—then run by the Nationalist Party—and refused to join the Communists when they defeated the Nationalists in the civil war. His father’s decision would mark him for life. Born in January 1949, just months before the Communist takeover, Hu was labeled as coming from a “bad background.” Over a very rainy afternoon, I met Hu in his home on the outskirts of Wuhan, where we talked about the lure of the Cultural Revolution, the difficulties of working within the system during this era of political persecution, and his decision to sign the bold civil rights manifesto Charter 08, which endorsed freedom of association and an end to one-party rule, among other principles. Ian Johnson: How do you see yourself as a writer? After the Cultural Revolution you joined the Chinese Writers Association—the government body that manages authors. That meant some financial stability because all writers in the association get a salary, even if it’s not much, but it also means that the government could cut this salary if it doesn’t like your work. And yet you have often criticized the system. Do you think of yourself as being tizhinei (inside the system) or tizhiwai (outside the system)? Hu Fayan: Somewhere in between. Before Tiananmen in 1989, I was quite hopeful. A lot of people hoped. But a lot of this hope was destroyed by the tanks and machine guns. Since then, I’ve become more critical and my works have a harder time getting published. And yet I am not tizhiwai. I still get a pension but except for that don’t have any relation to the system. I don’t attend the association’s study session or writing competitions and don’t follow their value system for writing. I feel I am a free and independent person. I basically separated myself from the system after 1989. After that, I basically didn’t attend their meetings. It’s been almost 30 years now. But you’re not a dissident. I do not take as much direct action as some. If you think of Ai Xiaoming. If she sees that rights are being violated, she grabs a camera and goes to record it. Perhaps it has something to do with my personality or way of life. Ever since being a sent-down youth in the Cultural Revolution, I’ve feared hardship and fatigue. I like to be at home. But in some important questions, for example Charter 08, I was among the first signers. In important actions, if I feel I should express myself, then I try to pick up my courage. I don’t want to give up my freedom to express myself because of this dread. So when a lot of people reject interviews with the foreign media, I feel I should talk. I try to be as candid as possible and frankly say my views. This year is the fiftieth anniversary of the start of the Cultural Revolution. Looking back, how do you feel about it? It was a very confusing time. I didn’t oppose it right at the start. I could sense a beauty. It promised a more beautiful society, and a more equal society. The people they wanted to attack were bureaucrats and those whose lives were removed from the ordinary people’s lives. For a young person like me, in my heart, I really supported it. Did you have any initial qualms? Yes, the year before, 1965, was the twentieth anniversary of the end of World War II. Wuhan had a film festival related to the war. There was one film from East Germany with scenes of Nazis, storm troopers, and the first persecutions of Jews. They wore armbands and dressed in military uniforms, and carried guns or clubs in their hands, smashing the stores of Jewish people. The Jews had the star of David stitched on their chest. They were pulled out of their homes, their rooms, their stores, and sent to concentration camps. They were portrayed as evil fascists for their crimes. Then in 1966, suddenly there were Red Guards everywhere. They also wore armbands. They also wore a kind of military outfit. They also paraded through the streets, shouting out slogans. And they beat people and deported them from cities. This never left me: Why did our Cultural Revolution resemble the Nazis? The Cultural Revolution is the subject of your latest book, Midong (which could be translated roughly as “Winter of Confusion” or “Wintry Haze”). What brought you back to that era now? I started writing it in 1985. I wrote 50 or 60 thousand words. But I stopped. I felt I had to understand things better, and think things through more deeply. We had just exited from the Cultural Revolution, so maybe we didn’t see a lot of things too clearly, or we were affected by the things we had heard. Then I decided around 2009 or 2010 to write it. And then it was published in 2013. It was published by the prestigious People’s Literature Publishing House, but then immediately banned. What happened? You’re allowed to speak about what is of use to them. But you can’t talk about what isn’t of use to them. What in your book is of no use to them? For example, the different classes in the Cultural Revolution. Different people experienced it differently. It wasn’t a few people who were in charge who were bad from head to tail. It was different people in different phases, who did bad things. For example, from June to October 1966, it was one group. That was mainly the governing class and their children—the “old Red Guards.” You can’t talk about that group. Instead, you can only talk about a specific group of evil-doers, such as the Gang of Four, or Lin Biao, or the Rebel Faction. And then the second period, from October 1966 to the end of 1967, this was the lower classes. The di fu fan huai you class—landlords, wealthy, counter-revolutionary, bad elements, rightists—as well as common workers and peasants. Those kind of kids. They made the cadres suffer a lot. So the evil in this period must be this group’s responsibility. Also in this period, a lot of evil things were done by the military, which joined in as well. They took over the ruling apparatus from the bureaucrats. But what the military did can’t be discussed. Midong and many of your books are set in Wuhan. What is the attraction of this city to you? It is crowded, polluted, and on rainy days like today all the roads seem to be flooded. And your new wife has Austrian citizenship. Why not move there? I spend some time in Austria. Maybe we will retire there when I am finished writing. But this is a place I’m really familiar with. My stories are all set here. If I go somewhere else, I’d have to understand that area all over again, but here I know it all, I can feel it. It’s a direct feeling that I have when I write here. I don’t want to go to a beautiful place that doesn’t have anything to do with me. Every day I see it, I hear it, I breathe it. This piece of land is the truest thing. It’s the most real. Wuhan has been at the center of much of modern Chinese history. This was the starting point of the revolution of 1911 that overthrew China’s last dynasty. It was also a center of China’s industrial and commercial life. How has this shaped the people here? The Yangtze and the Han rivers, these two great waterways, their upper reaches extend into China’s far west. So this makes it a transport hub and influences Wuhan people’s traits. It makes them more independent and commercially minded. Think of the Cultural Revolution [from 1966-1976]. Back then, people here really opposed the old order. When I say old order I mean the 17 years of Communist rule from 1949 to 1966. In the Cultural Revolution, people borrowed Mao’s words to oppose the Communist system. That independence of spirit is found in Ruyan, the heroine of Such Is This World@sars.come. Ruyan’s political awakening seems to be inspired by three things: personal memories of events like the Great Leap Forward; an open Internet; and efforts of the rights lawyers and citizen activists, such as those in the 2003 Sun Zhigang case. Now, 10 years later, these tendencies are no longer there. The old people who knew the past are dying, the Internet is censored, and the rights lawyers have been crushed. In China’s present situation, could a Ruyan have a similar enlightenment? Chinese has an expression: jiangshan yigai benxing nanyi. This means “rivers and mountains move easily but it is hard to change one’s nature.” Ruyan is a dedicated, serious, and tenacious person, even if she seems delicate and weak. And speaking about China generally, I think that once you open some windows, you can’t close them. And in terms of personal memory, the space for this is still growing. Many old people, their families, their children—they’re all working hard to dig out personal memory, family remembrances. One of the other heroes of the novel is Damo, an unassuming electrician who is actually well-read and a profound thinker. Which kind of Chinese does he represent? These people haven’t sought out great success inside the system, or profit by being in the mainstream. They want free knowledge and a proper reflection and expression of themselves as their highest goal. This group is the greatest force in the past decade toward liberating thinking and criticizing society. It’s precisely because these people have independent professions that they aren’t afraid of the government smashing their rice bowl. Many have very simple lives, even to the point of poverty, but can make a living and take care of themselves and their family. Has state security ever approached you? So there are good people inside and outside the system. Even though he isn’t an activist, he realized that there is significance in others doing it. I am gratified that this is different from the Cultural Revolution. Perhaps there is some progress.